I have been using Crazy Mixed Up Salt on everything since I rediscovered it so I decided to make my own using beautiful organic herbs and pink salt crystals. The result came out AMAZING. 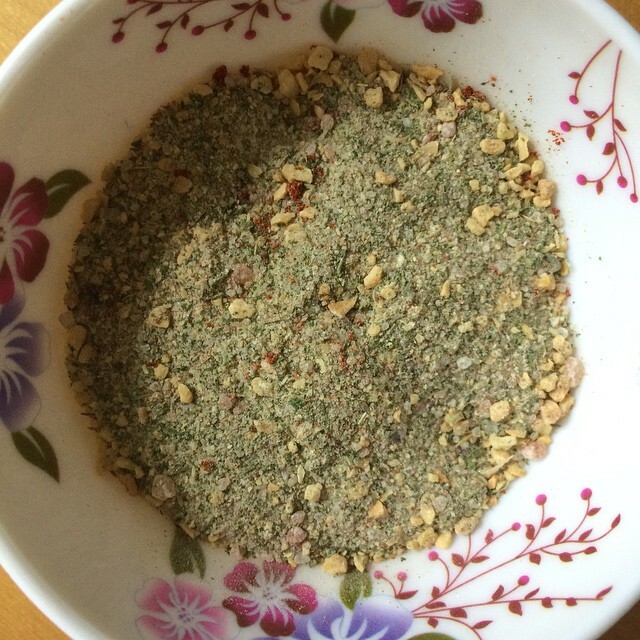 You can vary the amounts in any way you are moved to do so, more heat, dried lemon zest would be SO good in this and to use it for baking, roasting and grilling O M G….It makes a under two cups, and I store it in a beautiful little glass jar in the cabinet. Makes me happy. I am making “Simple Tastes Like Chicken Tofu” as we speak!!! In a blender or Vitamix, blend the salt to a powder. Remove the salt and add all of the other ingredients and blend until the desired consistency is reached- I don’t blend mine to a powder so there is some texture to the salt. Add the salt back in and mix on low until the salt is well incorporated. Transfer to an airtight container and use for everything! Soups to salads, casseroles to tofu cutlets, I LOVE this salt! This entry was posted in sides and tagged awesome sauce, raw, salt, seasoning. Bookmark the permalink.